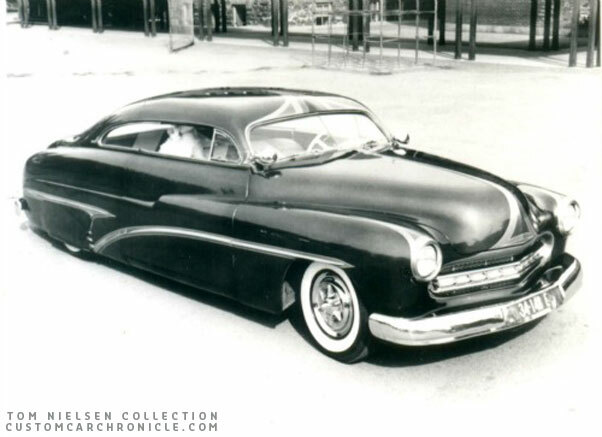 This Mercury was the first chopped ’49-’51 that Tom Nielsen had ever seen in person, so it made quite an impression on him back in 1957. By 1958 there weren’t too many “new”, chopped ’49-51 Mercurys appearing in the “small pages” magazines that covered customs. Most of the more famous California customs of that model were being redone in a late fifties mode or had disappeared from the car show scene. So, I was pleasantly surprised to see a sharp looking. 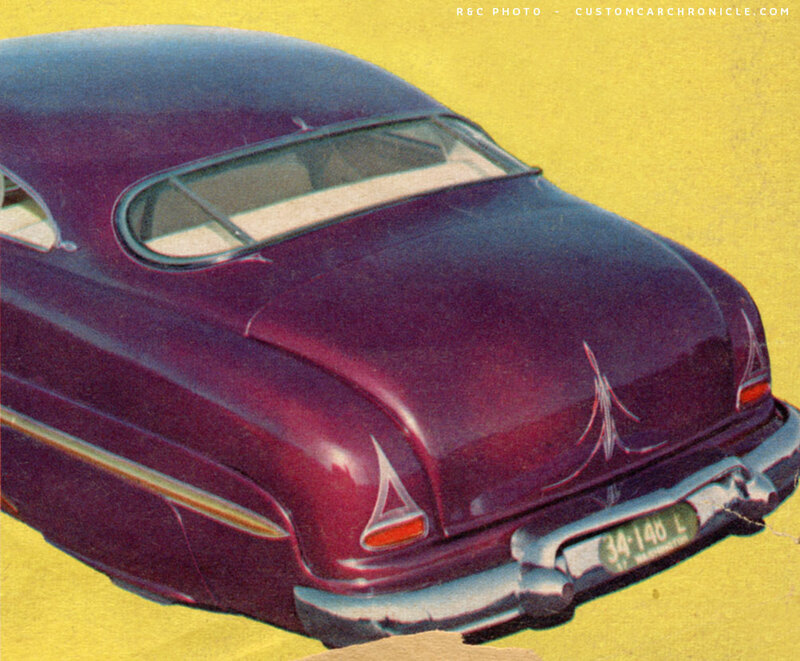 full custom, ’49 Merc on the cover of Rod and Custom when it came out in April, 1958. To see a Northwest car on the cover was a bonus and it showed that there were some cool cars being built up North! Another plus was a car from Oregon, Bill Hoffman’s 1953 Chevrolet that shared the cover with “The Sahara”. The Northwest was getting its due as the birthplace of some outstanding custom cars by 1958. 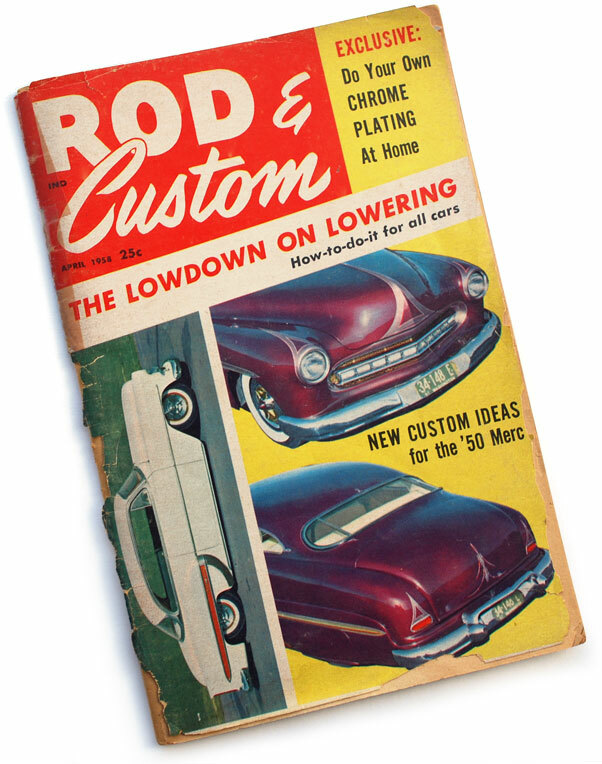 Two color photos of the Mercury were used on the cover of the April 1958 issue of the Rod & Custom magazine. Inside the car was featured on four pages. 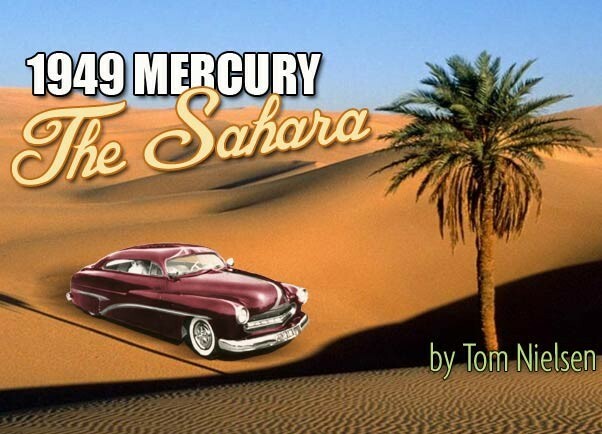 The Mercury’s name “Sahara” was probably inspired by another home built R&C cover car. The name “Desert Beauty” that George Gowland had given his full custom was both memorable and appropriate. The “Sahara” Mercury came from Yakima in Eastern Washington. It is an area that is known as the Palm Springs of Washington state. The Yakima Valley is well known for apples, wine vineyards and growing hops used in making beer. 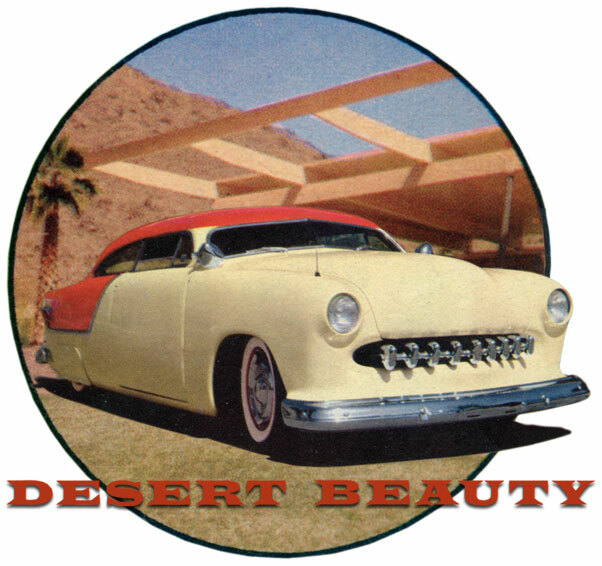 George Gowland’s Shoebox Ford “Desert Beauty” from the September 1955 issue of Rodn and Custom Magazine may have been the inspiration for the name Sahara that the brothers gave their custom. 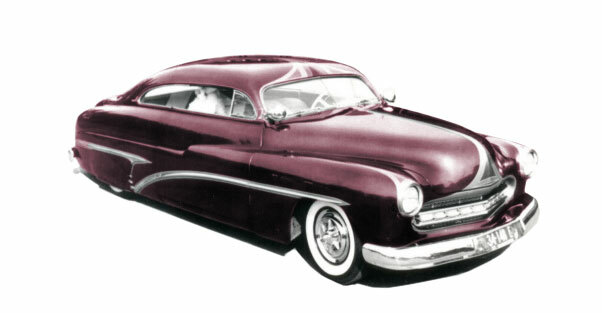 The Sewell brother’s car was unique in that it had many custom modifications not seen on other custom ’49-’51 Mercurys. 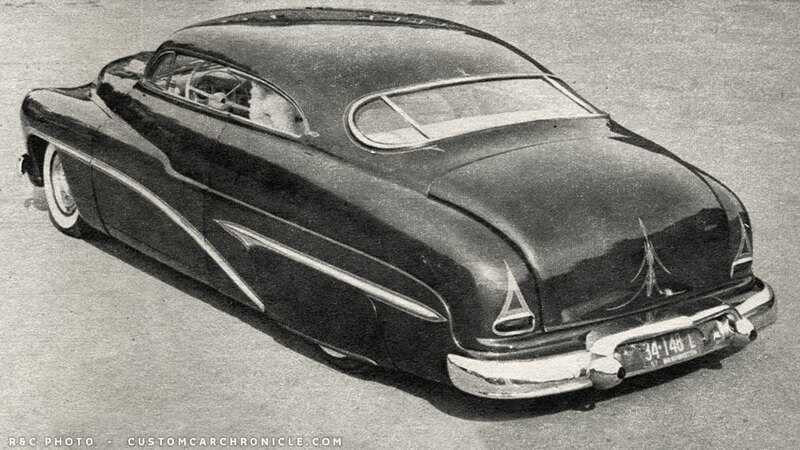 It was inspired by Ayala and Barris built Mercurys from an earlier time. But, as they said on the cover of R &C, it had some fresh, new custom ideas. The car was home built in Eastern Washington by the two brothers in a dirt floor lean-to. They did everything on “the Sahara”, except the interior. I think that their do it yourself work ethic was one of the most interesting things about this Washington custom. The plush rolled and pleated interior was in trend with the later fifties style that was more elaborate than earlier custom interiors. 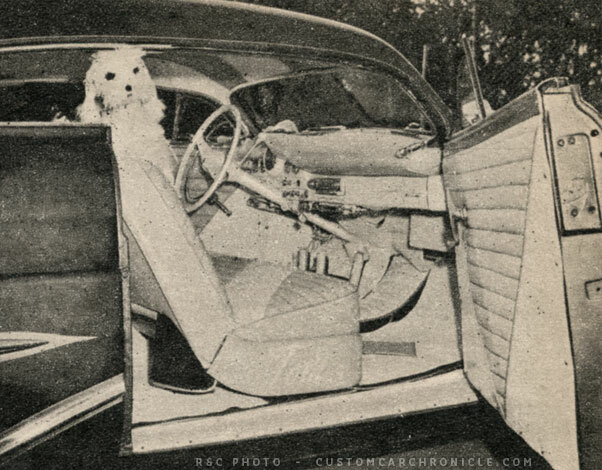 Installing a later Ford dash was another new idea that the brothers had incorporated into their custom Merc. They were awarded “Best Interior” at the Tacoma Rod and Custom Show. The purple paint with the multi colored scallops seems to highlight the right areas of the body to set off the custom modifications perfectly. The Sewell brothers showed the car at various indoor shows between 1957 and 1958 picking up many trophies along the way. When I was thirteen, I saw “The Sahara” at the Everett Car Show and I remember how “cool” it looked on display. 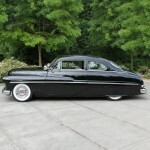 This Mercury was the first chopped ’49-’51 that I had ever seen in person, so it made quite an impression on me. It took a second in Full Custom and the People’s Choice Award at that Everett show. Bob and Tom Sewell also helped put on a car show in their hometown of Yakima around 1958. The Sahara must have made quite a hit at that local show. The license plates front and rear were cut into the bumpers with a clear covering over the plate. The grille was made up from two 1951 Kaiser grille bars, with a combination of clear plastic, and chrome plated parts. This was set in a mesh backed oval opening for just the right custom touch. This rear ¾ view of the rear shows the ’55 Buick side spear and the trim piece added to the rear quarter panel. As I am a fan of ’49 Mercs, I appreciate the fact that they retained the original three piece rear window! The grille opening was reshaped with another ’49 top portion, flipped upside down, in a similar way as the Ayala’s did it on Louis Beettancourt Mercury. Two ’51 Kaiser grille bars make up for the basic shape of the grille. 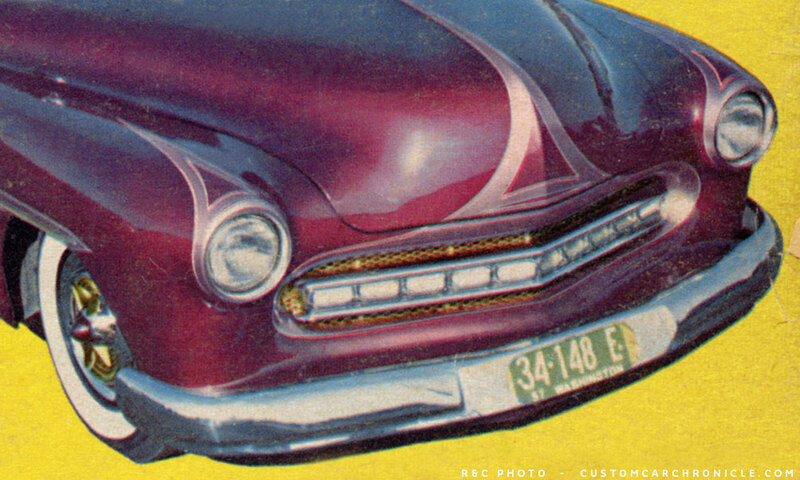 THis color photo shows the Kolor Khrome use on the mesh behind the grille, as well as on the hubcaps. At the rear the brothers used a 1953 kaiser overrider to cover the set in license plate. 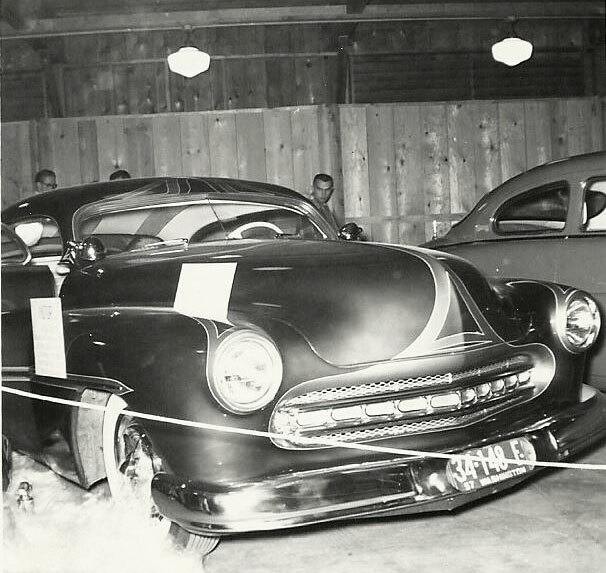 Especially the front end of the car resembles to look of the Johnny Zupan Mercury, which was based on the Louis Bettancourt Mercury created by the Ayala’s. After a couple years of appearing in local shows in 1957 and 1958, by 1959 I never saw the “Sahara” entered in any of the Seattle-Tacoma car shows again. I am not sure what happened to it? Like many customs of that era it just disappeared from the scene. However, “The Sahara” made quite an impression when the Sewell brother’s Mercury hit the cover of Rod and Custom in April 1958! We can all appreciate this Washington state beauty and its fresh ideas even today! 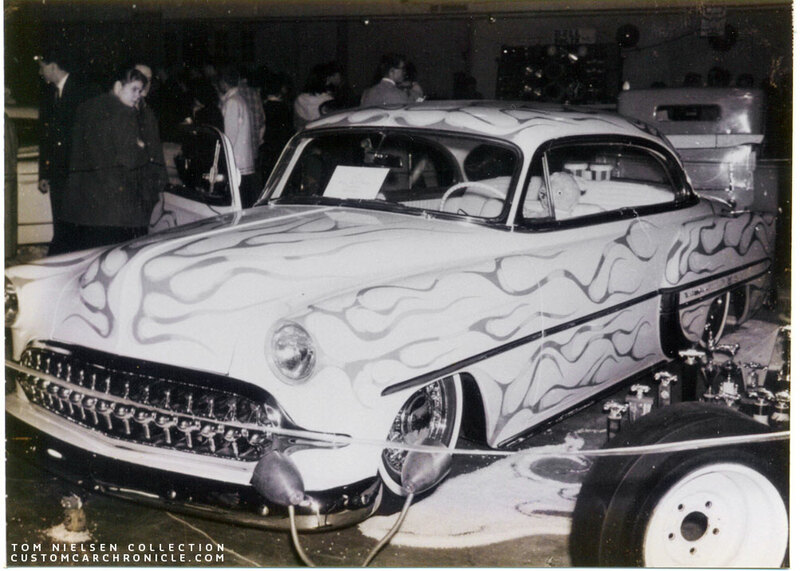 Sharing the cover with “The Sahara” was this “awesome looking”, ’53 Chev custom/competition rod owned by Bill Hoffman from Oregon, shown here at the Portland Roadster Show. Tom Nielsen is a long time Custom Car fan with wonderful collection of photos of 1940's to 1960's custom cars. He loves to share his collection and to tell stories about them. Great to see another article by you, Tom! Funny how you can remember exactly where you were when… I was in the gift shop of the Billings, Montana airport seeing my sister off, when I spied that very magazine! Both the Chevy and the Merc immediately caught my eye. They just epitomize all that was going on in the California dreaming custom car world, outside California. To this day, they both stand high up in my personal “likes” of the day. Possibly about that Mercury. My Conquistador buddies Don “Duck” Butler and brother Curt migrated out to Portland by the turn of the 60s. Curt became a lifetime police officer in Portland. About the mid-60s I stayed with them for part of a summer, and one story Curt told me has stuck with me. In the police impound area, he said there had been a chopped 49-50 Mercury that once had been a pretty well known car in the area. How it got there, and what happened to it, he didn’t know. But Curt was into customs, and had his own 51 mild custom at about the time he was describing. Could the Portland impound Merc be the Sewell brothers’ car? One of my favorite Pacific Northwest cars. Thanks for spotlighting it, Tom!